It's easy to conjure up the romantic image of an artist in his or her garret, toiling away alone to turn inspiration into art. Printmakers who rely on big presses to make their work don't often have that luxury of solitude. They invest with other artists in cooperative studios, where many people have access to the machinery of their medium. They end up having a different luxury: community. In 1980, four recent art school graduates rented a space in East Cambridge and installed some presses. Jane Goldman, Catherine Kernan, Ilana Manolson, and Mary Sherwood called their enterprise Artist's Proof Studio. After only four years of creative cross-fertilization, the studio closed when gentrification priced the artists out of the rented space. 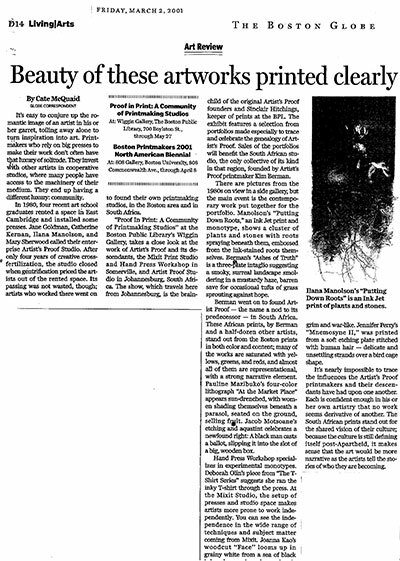 Its passing was not wasted, though; artists who worked there went on to found their own printmaking studios, in the Boston area and in South Africa. “Proof In Print: A Community of Printmaking Studios" at the Boston Public Library's Wiggin Gallery, takes a close look at the work of Artist's Proof and its descendants, the Mixit Print Studio and Hand Press Workshop in Somerville, and Artist Proof Studio in Johannesburg, South Africa. The show, which travels here from Johannesburg, is the brain-child of the original Artist's Proof founders and Sinclair Hitchings, keeper of prints at the BPL. The exhibit features a selection from portfolios made especially to trace and celebrate the genealogy of Artist’s Proof. Sales of the portfolios will benefit the South African studio, the only collective of its kind in that region, founded by Artist's Proof printmaker Kim Berman. There are pictures from the 1980s on view in a side gallery, but the main event is the contemporary work put together for the portfolio. Manolson's "Putting Down Roots," an Ink Jet print and monotype, shows a cluster of plants and stones with roots spraying beneath them, embossed from the ink-stained roots themselves. Berman's "Ashes of Truth" is a three-plate intaglio suggesting a smoky, surreal landscape smol-dering in a mustardy haze, barren save for occasional tufts of grass sprouting against hope. Berman went on to found Artist Proof - the name a nod to its predecessor - in South Africa. These African prints, by Berman and a half-dozen other artists, stand out from the Boston prints in both color and content; many of the works are saturated with yellows, greens, and reds, and almost all of them are representational, with a strong narrative element Pauline Mazibuko's four-color lithograph “At the Market Place" appears sun-drenched, with women shading themselves beneath a parasol, seated on the ground, selling fruit. Jacob Motsoane's etching and aquatint celebrates a newfound right: A black man casts a ballot, slipping it into the slot of a big, wooden box. Hand Press Workshop specializes in experimental monotypes. Deborah Olin’s piece from “The T-Shirt Series" suggests she ran the inky T-shirt through the press. At the Mixit Studio, the setup of presses and studio space makes artists more prone to work independently. You can see the independence in the wide range of techniques and subject matter coming from Mixit. Joanna Kao's woodcut "Face" looms up in grainy white from a sea of black ink, a harrowing visage that is grim and war-like. Jennifer Perry's "Mnemosyne II," was printed from a soft etching plate stitched with human hair, delicate and unsettling strands over a bird cage shape. It's nearly impossible to trace the influences the Artist's Proof printmakers and their descendants have had upon one another. Each is confident enough to his or her own artistry that no work seems derivative of another. The South African prints stand out for the shared vision of their culture; because the culture is still defining itself post-Apartheid, it makes sense that the art would be more narrative as the artists tell the stories of who they are becoming.